Kentucky is the birthplace of Bourbon, but whiskey isn&apos;t the only spirit with an early Kentucky connection. The first commercial wine vineyard in the United States was planted on a hill near the Kentucky River in 1798 by Jacques Dufour, winemaker to Marquis de Lafayette. Dufour began his enterprise with the backing of Henry Clay and other influential statesmen. The region&apos;s famously fertile soil and relatively temperate climate were attractive to Dufour and his investors. This is true for today&apos;s new generation of entrepreneurs who are dedicating themselves to reviving the art of viticulture on Kentucky&apos;s family farms. The story of wine&apos;s renaissance in Kentucky is entwined with the story of Kentucky&apos;s tobacco industry. Tobacco sustained many Kentucky family farms for generations. Changing attitudes and regulations have left many farmers searching for an alternative to their tobacco crops. To stay on the land they love, diversification and creativity are imperative. The shift away from tobacco has spurred many Kentucky farm families to discover what Jacques Dufour discovered over two hundred years ago: the climate and the soil in the Bluegrass Region are excellent for wine grapes. Bluegrass Note: Kentucky&apos;s wine industry is expanding rapidly. In 1998, there were only 40 acres of wine grapes in commercial vineyards in the state. Today, we have 71 licensed wineries and nearly 150 growers cultivating approximately 600 acres of wine grapes. This year, Kentucky is on track to bottle more than 100,000 cases of wine. Black Barn Winery crafts one wine, by design. Big full-bodied dry reds are made with old-world traditions using fresh grapes brought to Kentucky from California. Black Barn wines are INDY International Wine Competition winners. The winery is located inside a renovated tobacco barn on a Lexington horse farm, and yes, the barn is black. The "back story" on wine maker Colin Boyd includes tales of Counts, chateaux and ...lepers. Be sure to ask him when you visit. Visit year round, by appointment. Eight miles north of downtown Lexington. How many wineries can say they offer views of a nearby castle? In Europe, probably quite a few, but this is probably the only one in the United States. Castle Hill Winery sits opposite CastlePost, a luxury boutique inn first built as a private residence. The tasting list includes eleven wines , from a spicy Shiraz to a light and sweet White Zinfandel. The view may inspire you to take home a bottle of their "Camelot", a wonderful light white perfect with seafood or light cheeses. Open daily, Monday through Saturday 10 a.m. to 6 p.m. and Sunday noon to 5 p.m.
Nine miles west of Lexington. Bluegrass Note: Though Jacque Dufour abandoned his vineyard by the banks of the Kentucky River, later vineyards around the region did flourish, and by the 1800&apos;s Kentucky had become the nation&apos;s third largest grape and wine producer. Prohibition brought Kentucky&apos;s grape and wine industry to a halt, and many Kentucky farmers turned to the production of tobacco, which proved to be much more profitable. You could spend all day on the grounds of Equus Run, and much of the night if you come to attend a theatre or music event at their amphitheatre. The stone faced Tasting Room and gift shop is surrounded by trees and native flower gardens with a tiered deck overlooking the Riesling vineyards. Check out the horse sculpture "Veggetariat" and other horse sculptures on the grounds. Wander down to Elkhorn Creek for some fishing, kayaking or picnicking. 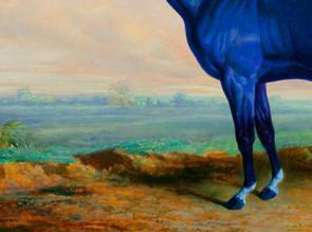 Like most Kentucky wineries, the rich soils of Equus Run were initially cattle fields with hay and tobacco crops. Winemaker and owner Cynthia Bohn has transformed the land with her belief in friendship, community and tradition guiding each business decision. The result: great wines and great ambiance. Open seven days a week, year round. Twelve miles northwest of Lexington. In August of 1802, Francois Andre Michaux stopped by for a visit. The French botanist had heard that a society to "naturalize the vine in Kentucky" had been established not far from his route as he traveled from Lexington to Harrodsburg. He was graciously received by Jacques Dufour, and wrote about the encounter in his journal. Modern day travelers will have an easier time reaching the site on the banks of the Kentucky River which is again under cultivation, keeping the name given it by Jacque Dufour. It&apos;s all due to the efforts of the current owner, Tom Beall, who owned this rural stretch of land for nearly 10 years before he discovered the site&apos;s extraordinary historic significance. The vineyard strives to recreate as closely as possible the structures and plantings that would have been found here in the late 1700&apos;s. The original terraces have been re-established and planted with the Cape Grape, the same variety used by Dufour. Additional varietals have been planted as well. History buffs and wine aficionados alike will want to stop by and sample one of their ten wines for a "true taste of history". Days of operation are seasonal: call ahead. Twenty-five miles south of Lexington. Wine maker Phillip DeSimone feels that each bottle represents a piece of the Bluegrass and his family’s Italian heritage. Grimes Mill Winery is a family run business and their hand crafted wines are produced from grapes grown and cultivated primarily on the family farm. The Reserve Malbec won Double Gold Winner at the Indy Wine Competition and was a Gold Winner at the Craft Competition in Los Angeles, California. The DeSimones would love to introduce you to their entire wine list when you visit. Individuals and tour groups are welcome. There’s a Bocce Ball court, and they’ll teach you how to play if you don’t know the game. Open year round. Call head to schedule a tour. Twelve miles southeast of downtown Lexington. Nestled in the Kentucky River valley, this vineyard offers walking tours every Saturday, weather permitting. Tours are $20 per person, last about 30 to 45 minutes and are follwed by a “sit down” wine tasting and pairing. Tastings take place in The Peach House, built in 1890. Be sure to try out the Cabnernet Dore. This new hybrid varietal is a cross between Cabernet Sauvignon and Norton grapes. Open year round. Tasting room open to the public Thursday and Fridays from 12 p.m. to 6 p.m. and Saturday 12 p.m. to 4 p.m.
Kentucky&apos;s Jean Farris Winery is the only one outside California to earn a double gold designation in the San Francisco wine competition. Jeanie O&apos;Daniel&apos;s passion for producing the finest product extends to the restaurant that promotes the farm to table concept with vegetables and herbs from the winery&apos;s garden. The menu changes seasonally. At the tasting bar, try to sample Malbec; made in small batches from Kentucky grapes. The Jean Farris Pinot Noir is harvested from the vines planted in the sandy soils at the foothills of the Appalachian mountains of Eastern Kentucky. Taste their Chardonnay with layers of oak, flavors of tropical fruit, notes of lemongrass and a hint of mineral characteristic of the central Kentucky wine growing region. The restaurant and wine tasting bar are open Thursday through Sunday, year round. Eleven miles southeast of Lexington. Bluegrass Note: American and American-French hybrids fare best in Kentucky, but a wide variety of grapes do well, giving vintners many options for exercising their creativity. 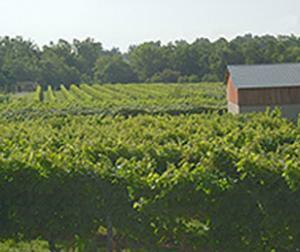 According to the University of Kentucky, the most heavily planted wine grapes in Kentucky are the American cultivars Concord, Niagara, Norton; Hybrids Cayuga White, Chambourcin, Chardonel, M. Foch, Traminette, Seyval, Vidal Blanc, Vignoles; and the European cultivars Cabernet Franc, Cabernet Sauvignon and Chardonnay. Tucked away in a hilly corner of Anderson County, on the western edge of the Inner Bluegrass Region, Lovers Leap rewards its guests with stunning views and award-winning wines. A large show room with vaulted ceiling accommodates wine tastings and special events. A long covered porch overlooks the vineyards and entices guests to linger and unwind. If you are a fan of rich reds, discover a Cabernet Sauvignon made with all Kentucky fruits. Another Kentucky treat: the 2013 Estate Reserve Cynthiana- grown from some of the oldest Norton plantings in Kentucky. This wine has a complex profile that is rich and pleasurable as it expresses this truly American grape. If you are looking for a dry white table wine, the new Tri-Fecta White is a blend of Traminette, Cayuga and Vidal Blanc with a light, crisp finish. Open Tuesday through Saturday, all year. 30 miles west of Lexington. Located in the heart of the Bluegrass on the Peach Family Farm, these vineyards benefit from careful tending and from the unique components of Kentucky&apos;s rich soil. and produce more than a dozen wines. 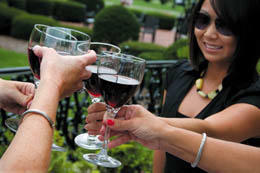 Enjoy live music on most Fridays, year round, during "Sip and Savor". Owners Lenée and Chad usually fire up the grill on Fridays, but you can enjoy sandwiches or a cheese plate any day. Visitors will enjoy browsing the gift boutique for unique fashion and wine accessories. The vineyards and winery are located midway between Frankfort and Lexington, only a few minutes away from Keeneland Race Course. Bluegrass Note: Want to see all these wineries on a map? 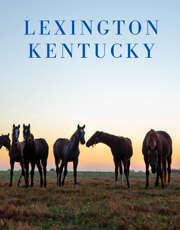 Go to www.kentuckywine.com and click on Wineries and Vineyards. There you will find a current interactive map of all the wineries in Kentucky. You can also check out the web video series, "Vintage Kentucky Tastings." One of the newest wineries in the Bluegrass Region&apos;s burgeoning wine industry, Rising Sons is a family endeavor, and the family&apos;s pet pig, several llamas and a dog named Bee all look forward to your visit. Kentuckians love their Blackberry wines. Rising Sons&apos; offering is sweet without being syrupy, and finishes tart on the tongue. Looking for a wine to complement a fine cigar? Try Cataldo&apos;s Salute, a Norton that&apos;s been on oak for 2 years, producing an earthy, mellow flavor with hints of tobacco. This wine honors Kentucky tradition, the family&apos;s Italian heritage, and grandfather Cataldo! Open Tuesday through Sunday, year round. A long, winding driveway through open fields takes you past the burgundy roofed Barrel Barn to the Homestead Tasting Room. Talon&apos;s tasting room is located in a restored 1790&apos;s brick farm house that also accommodates a gift shop and rooms for special events. The Monarch Pavilion is just outside the back door and is a favorite place to sip a glass of wine. If you are lucky, you&apos;ll see colorful powered-parachute "airplanes" taking off and landing in fields adjacent to the vineyards. All of Talon&apos;s wines are medal winners, from the dry reds to the sweet whites, and have won accolades from competitions including the Wines of the South Competition, the International Eastern Wines Competition, the Lonestar International Wines Competition and others. At your tasting, be sure to include their Equestrian Series III, a Kentucky grown Cabernet Franc and Cabernet Sauvignon blend. Wine maker Kerry Jolliffe has created a self-guided tour to introduce you to Talon&apos;s scenic vineyards and their wine-making and bottling processes. Picnicking is encouraged throughout the year. Twelve miles south of downtown Lexington. Wine maker Neil Vasilakes is serious about making great Kentucky wines that will satisfy the most sophisticated of palates. He also enjoys creating unusual wines with a Kentucky twist such as a Black Walnut wine aged in Maker&apos;s Mark barrels or a Port aged in Woodford Reserve bourbon barrels. Wildside Winery is also known for exceptional berry wines made from 100% fresh Kentucky fruit for robust flavor: blackberry, blueberry and strawberry. Consider timing your visit with one of their special food pairing events. Experience Wildside wines paired with various fondues, savories and sweets and learn more about the nutritional benefits of wine. Open Tuesday through Sunday year round. Sixteen miles southwest of Lexington.